SIRAHA, July 12: Bihari Yadav of Itarhawa town was a landlord until a decade ago. He owned a seven bighas land plot on the eastern side of the town. Now, Yadav is a ‘landless’ man. Though he still has land ownership certificate, he has less than a bigha of land. The Balan River claimed the rest of his land. “Now, I am no more a landlord. I am a landless man. Now I am a peasant,” he lamented. The same happened with Hari Yadav, Bihari’s neighbor. There was joint property of 22 bighas of land of his family. The family had a lavish life and commanded a huge respect in the locality. Their fate changed after Balan River changed its course and claimed their land. “We became landless after the Balan River changed its course and claimed all our land. Now, we are no more landlord, we are workers,” said Hari. Such cases are common in several villages of northern Siraha. People of Itarhawa, Bhagwanpur and Tilebona, among other towns and villages have lost their lands to the river. “Our land was very fertile. We lost it,” states Hari. He added the river has left farmers poor and helpless. Our land was very productive for paddy and wheat farming; Hari said adding that they used to produce many quintals of grains each year. “The farms used to be lush green during the paddy and wheat season. Looking at the land, we would feel very satisfied and rich. However, there is nothing left now,” he noted. According to Shree Prasad Pandit of Bhagwanpur Rural Municipality, the river has devastated thousands of life. It has wreaked havoc among the villages it passes through, he said. “Like a slow poison, it entered and ate up all our land,” Pandit said. In the past, the river would come from the east and flow towards the west. Water level would not be high; people would cross the river with little effort. However, during 1990, it suddenly changed its course. It started flowing towards south and in doing so, it inundated several human settlements and swept away huge swaths of arable land. “That was the first disaster but it continued to be a regular occurrence in the years that followed,” Pandit narrated. In 1995, disaster followed. Balan River swelled and covered hundreds of bighas of land. Locals claim that they would have been saved from the disaster if embankment controlled the river. “We did not have any embankment to minimize the loss. River left thousands of people homeless. It devastated our life,” Pandit reminisces. Over the years, fears of floods continue to torment these villagers. They have reached to the local administration several times for assistance, but so far little has been done in this regard, Pandit claimed. “It is the question of thousands bighas of land and thousands of families. The river has made our lives miserable. Despite several pleas, the government has always neglected our plights,” Pandit said. 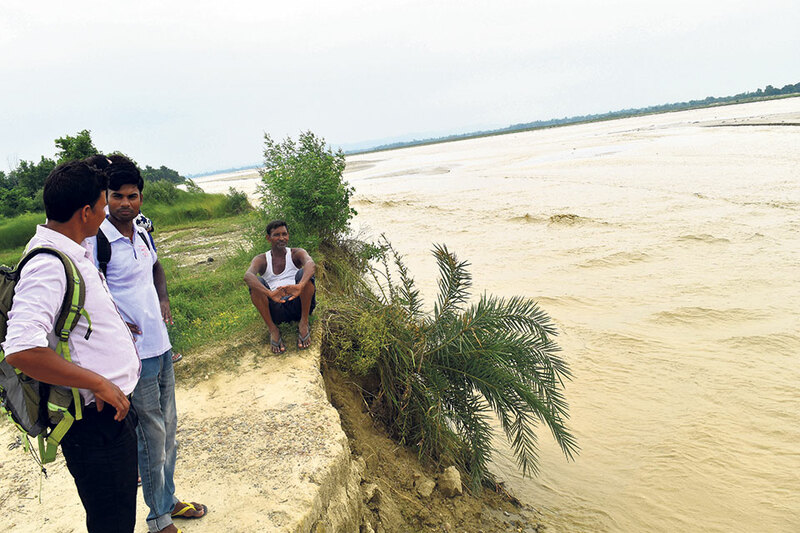 Locals lament that the river has turned their villages into a riverbank, which is neither good for building houses or cultivating crops and vegetables. They feel that the river did not turn its course without a reason. The river originates in the Chure range and locals feel that rampant mining and deforestation in the range played direct role in changing the course of the river. “We now realize that the river changed its course because of the excess exploitation of natural resources in the Chure region. There has been massive deforestation and mining in the region and this has directly affected the river’s course,” noted Pandit. He further accused the government of remaining a mute spectator of Chure destruction. Last week, the river once again wreaked havoc in the region. Locals claim that during the flooding, the river swept away around 300 bighas of land. Water Induced Disaster Control Committee of Lahan has recently started construction of embankments along the river’s bank. Chief engineer of the committee Mahesh Kumar Sah informed that the construction was going on in full swing. The embankment is constructed at an estimated cost of 13 million rupees, Sah informed. However, he noted that the problem of flooding won’t be solved unless the Chure range is conserved. “No matter how much we invest in building embankments, we won’t be safe from floods. The most important thing to do for a secure future is to conserve the Chure range,” he said.